THE EPIC has remained the most grand of all literary formats, even as it has changed and evolved over the centuries. The Mahabharat that still makes a popular soap and J R R Tolkien’s Lord of the Rings continue to churn out profits. The novel, too, is a variant of the epic—one of the earliest English novelists called his novel a “comic epic poem in prose”. A more recent variant of the epic is the big science book. Scientists like Jared Diamond, Steven Pinker and Stephen Jay Gould straddle numerous scientific disciplines; their bestselling books draw from lofty scientific heights, but their readership is far beyond the world of science. Their books cover everything from the Big Bang to the culture of music, from the Boring Billion to the diabetes epidemic. Elizabeth Kolbert’s presence in this club is not typical, for she is not a scientist. After majoring in literature in New York, Kolbert became a journalist. In 1999 she joined The New Yorker as a staff writer and developed a special interest in reporting on science and using science to talk about various subjects. In 2006 she published her first full-length book, Fieldnotes from a Catastrophe; it emerged from three of her articles on climate change. It is widely rated among the best and most comprehensive books on climate change, as much for its comprehensive review of scientific literature as for animated reportage from locations where effects of climate change are apparent. 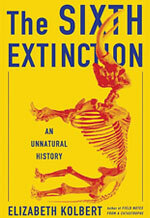 Earlier this year, Kolbert released her second book, The Sixth Extinction: An Unnatural History. It grew out of a 2009 article she wrote in The New Yorker on large-scale species extinctions. The subject has emerged gradually since the 1990s when scientists noticed the disappearance of several frog species. The reason was unknown; some said it was pesticides, some said a bacteria or a virus. The book’s first chapter explains how the matter was settled: it is a strain of chrytid fungus never seen before. How the fungus spread is a telling account of how humans have changed the planet. A species of African frog, immune to this fungus, was used in the 1950s for pregnancy tests across continents. Which indicates the depth and variety of information in the book. The structure deserves a mention. The heading of each of the 13 chapters has a sub-heading, which is the scientific name of a species. It becomes a key to one of the several extinction phenomena, the stem that connects several branches. This one species also helps set up the reader nicely for a ride through a setting completely different from the others in the book. Here is Kolbert chasing frogs in the rainforests of Central America; there she is out for a stroll and having an epiphany on the corals of the Great Barrier Reef off Australia’s coast; in a small Italian town Kolbert finds extinction records in geological strata in the company of a quaint scientist; she dives the depths of the Mediterranean to experience carbon dioxide bubbling through the ocean floor, offering a glimpse of what ocean acidification will do to marine life. Because she is not a scientist, Kolbert always stands with the reader. It is plain that the scientists who animate the book with charming quirks—and explain years of gruelling scientific enquiry with one or two lucid images—are friends of hers. She has spent time with them, got to know them on an emotional plane, ploughed through reams upon reams of scientific material. Yet there is no doubting she is there to find a great story to tell. All her investment is to ultimately make sense to the reader. Not to engineer a response or even recruit the reader for the cause of biodiversity conservation. Just to tell a moving story well. A story of epic proportions. Kolbert makes a mark with her ambition as a story teller. By the end of the book, the reader can feel all the conflicting pulls that result from an epic read; all the drama, all the bewilderment. In terms of time, you will have to contend with the mystic origins of life billions of years ago; just as suddenly you will get dragged forward to the Anthropocene, the age of humans, in which we are capable of understanding in excruciating detail how we are destroying innumerable strains of life, and are yet helpless in stopping it. In terms of space, each chapter is a physical travel through Dante’s Inferno, Purgatorio and Paradiso—right here on terra firma or submarine. For her canvas is as big as the blue planet. That she achieves all this in non-fiction is a testament to the epic form stepping out of the imagination, showing how reality is actually more dramatic than the imagination. For all that she has achieved, though, there is room for one or two complaints. As a narrator, Kolbert is too much of a reporter. The reader is not allowed into her emotional life. Which is incongruous with the astute eye she turns towards the scientists she meets. 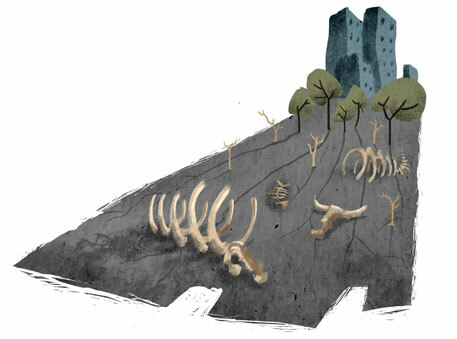 She consistently reminds us that humans are not the first to dramatically alter the biosphere. Cynobacteria changed this planet dramatically 2.4 billion years ago by oxidising it through photosynthesis. After Kolbert released the book came a study that proposes the greatest of the five extinctions in the fossil record—the third one that happened 252 million years ago, called the Permian-Triassic Extinction Event, also the Great Dying—resulted from climate change caused by a population explosion of a bacterium called Methanosarcina. The fifth and the last one was 66 million years ago; it wiped out the dinosaurs. Scientists are veering around to accept that it was a giant asteroid that did it. In the sixth extinction, writes Kolbert, the asteroid is one invasive species: Homo sapiens. She must be congratulated for escaping the mandatory pressure to provide a message of hope or a way forward at the end of her book. The epic form, lest we forget, is tragic. This PERSONAL account by a biocultural anthropologist brings in dramatic stories from West Africa involving sobering aspects of fieldwork among malnourished children. 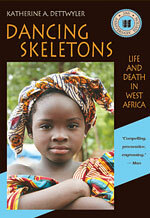 With nutritional anthropology at its core, Dancing Skeletons presents engaging experiences that the author had while researching on infant feeding and health in Mali. Dettwyler explores ethnocentrism, culture shock, population control, female circumcision, breastfeeding, child care and women's roles in patrilineal societies. Readers will both laugh and cry as she struggles to reconcile her role as an objective ethnographer, subjective friend and mother in the field. 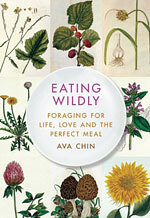 In THIS touching and informative memoir, food blogger Ava Chin takes off on an emotional journey to make sense of her family ties and romantic failures when her beloved grandmother becomes seriously ill. She retreats into the urban wilds, where parks and backyards provide not only rare and delicious edible plants, but a wellspring of wisdom. As the seasons turn, Chin begins to view her life with new eyes, experiencing the world as a place of plenty and variety. Her experiences in nature put her on a path to self-discovery, and help her find true love. Eating Wildly will stir your emotions and enliven your taste buds.